Hello everyone, first of all I want to say sorry for not posting as frequently as when I started off this blog. School kind of gets in the way a lot, with revision and homework etc. I’m trying to post more, and also trying my hardest to fit in a fashion post some when, as it seems most of my posts are beauty related. If any of you do read my blog regularly, then I hope this has cleared up a few small things. Also one other thing about this post, this may look like a lot of make up too you, or it may look like a very minimal amount of make up. However, this is just what I like to use, this isn’t my every day make up either, I do swap it around depending on what I’m doing. What I start off with is my Rimmel Wake Me Up Concealer in ‘Ivory’, originally this isn’t the concealer I was going for, but Superdrug and Boots had ran out of the Collection concealer that I normally use, so I opted for this one and I have to say I’m really impressed! After I’ve done my concealer, I go for my foundation. I swap between two foundations at the moment, but today I went for my Rimmel True Match Perfection Foundation in ‘Ivory’. I’m sure everyone has heard sooo much about this foundation, but it’s just the best, especially for only £6.99, it has such good coverage and as long as you get the correct colour, it doesn’t make you look orange what so ever! Next I just apply my pressed powder to set my foundation with the Real Techniques Buffing Brush. 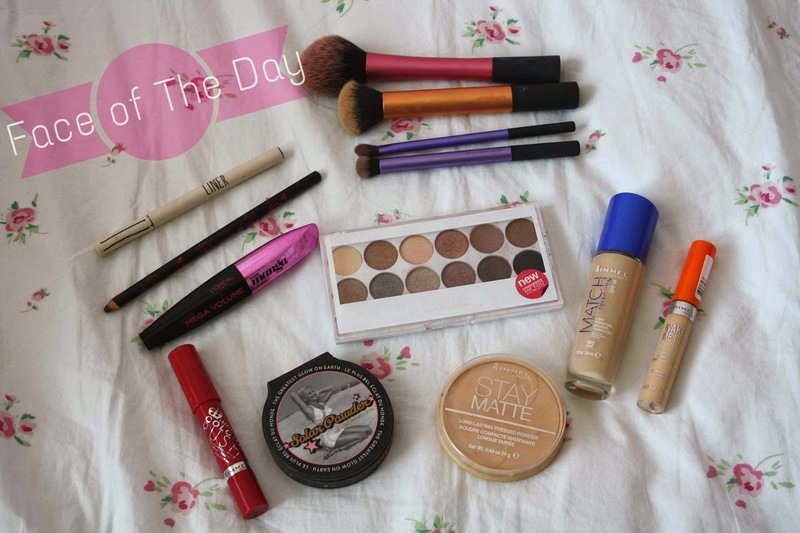 I use the Rimmel Stay Matte Powder in ‘Warm Beige’, (I see a theme with Rimmel products here oops)! I’ve literally been using this powder forever, it’s just my favourite and you can’t go wrong with it! After I take my Soap and Glory Solar Powder and use my Real Techniques Blush Brush and lightly just ‘dust’ that on my cheeks and up onto my forehead. I did do a review of this, saying I wasn’t sure about it as it came out very orange, but now I’ve grown to like it a lot, you just have to use it correctly. I blend this in after with a tiny bit more powder too make sure I’m not looking like an orange! Moving onto the eyes now, I used my MUA eye shadow pallet, using the matte brown colour as a base then the silver shimmer over the top. I did this using my Real Techniques Base Shadow Brush and Real Techniques Deluxe Crease Brush. I love this pallet as you can see in my ‘MUA Smokey Eyes’ post! Now for eye liner, I don’t usually use a liquid eye liner but today I was going for something different. I used the Topshop Liner eyeliner. I brought this quite a long time ago now, and they don’t seem to do it at Topshop anymore. However they have improved versions of this. I still really like it, as its not too heavy and is easy to rub off if you make mistakes, it’s definitely affordable too. Then I just apply my Miss Manga mascara, which I recently brought. I was using The Falsies before, but this was new and it looked exciting. I’ve been so impressed with it, and it gives volume to your lashes like no other! This also featured in my April favourites post, so you can check that out also! Finally on the eyes is just a black eye liner which I just apply to my water line. I know mine looks super tacky and horrible and yes I have had it for quite a long time but it still does the trick very well! I’m not even sure where this is from but there is still a lot of it left and I don’t see the point in buying a new one yet! Last but not least is lips! Today I have gone for the Rimmel Lasting Colour Rush Balm in Rumor Has It. I haven’t seen many posts or anything on these but honestly they are just amazing! They stay on all day even with drinking and eating. I just really recommend this too anyone its just too good, and the colour is gorgeous! Thankyou for reading, I hope you enjoyed and it wasn’t too long! Comment if you use any of these and what else you’d like to see on my blog.